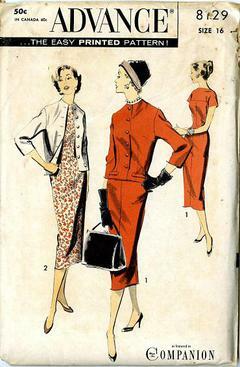 1956 Advance #8129 vintage sewing pattern, misses' Paris inspired sheath dress and jacket, plus size 16. Semi-fitted jacket is smooth over hips. Round neckline, button closing, flap trim. Fitted-in notch at back hem. Two-piece, three-quarter sleeve, button trimmed. Dress yoke and sleeve in one - neckline high at front, dipped at back. No shoulder seam, dart-fitted. Back walking pleat, back zipper. As featured in Woman's Home Companion magazine.